Whether you’re into bag making, or just use foam stabilizer in craft projects – there are several different brands available at varying prices. I’ve used three of them and have compiled a comparison. 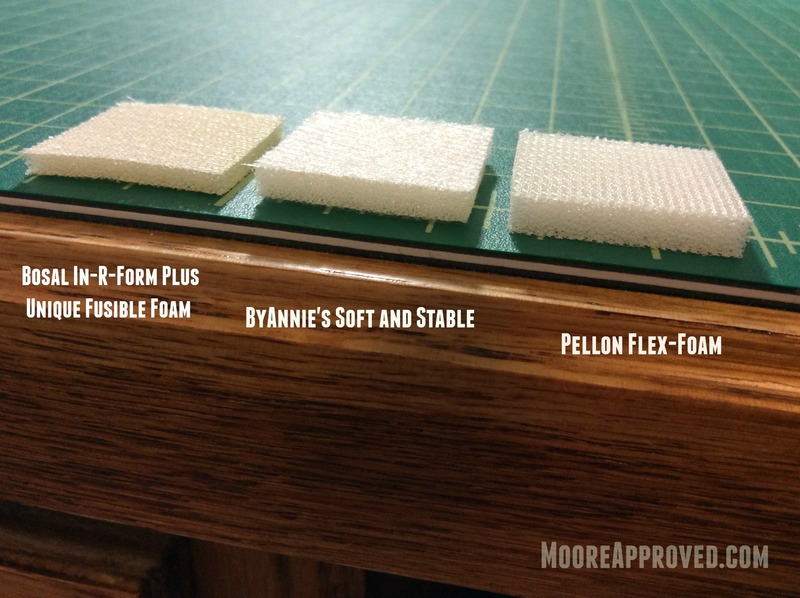 Bosal In-R-Form Plus Unique Fusible Foam, ByAnnie’s Soft and Stable, and the newest to the scene getting a lot of buzz – Pellon Flex-Foam FF-77. 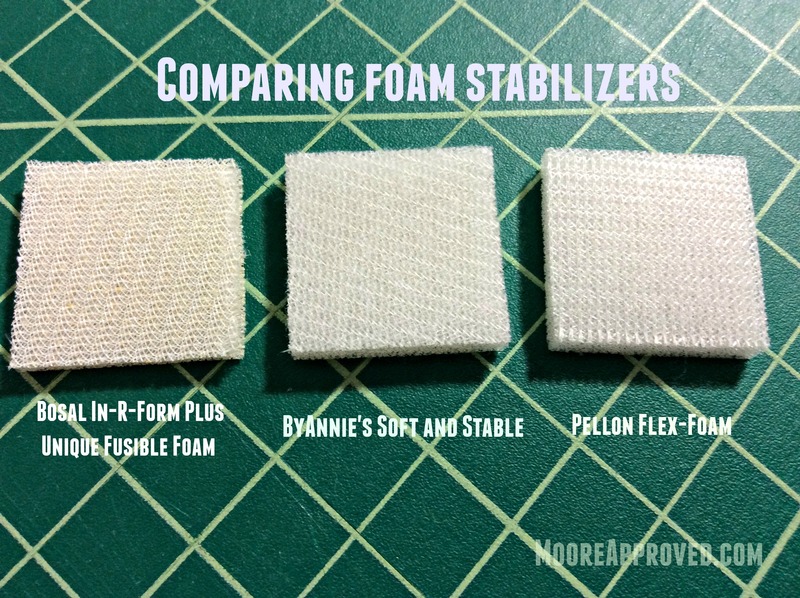 Moore thoughts: For some reason I expected the Bosal foam to price out the least expensive, but both the fusible and sew-in versions were actually the MOST expensive! The foam is thinner than ByAnnie’s and Pellon and the individual foam cells appear larger, but they are probably the stiffest out of the three. For me, that’s actually a plus since I prefer bags to be more “stable” than “soft.” With the double sided fusible foam, I have noticed there is some dimpling/wrinkling on the fabric after fusing it to the stabilizer. 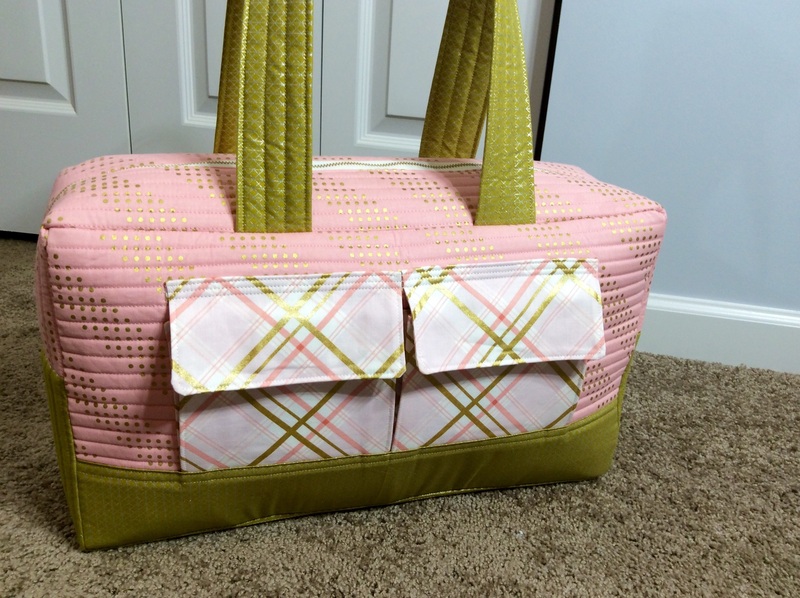 Compared to ByAnnie’s Soft and Stable, it is slightly better for making large bags. Both the Tudor Bag and Cargo Duffle made from Bosal are sturdier in construction and hold their shape. Description: Give a professional finish to bags and other projects with this great product. It has many features that make it superior to other battings and stabilizers including being soft comfortable lightweight and easy to sew. It also has great lasting body and stability that maintains its shape. Out of the three, it’s the most dense and “plush” in my opinion. The fabric on both sides of the foam is very soft compared to Pellon’s Flex-Foam which feels silkier. Definitely more “soft” than “stable” – depending on the project – this could be a positive or negative. Soft and Stable has the most drape, and the Aeroplane Bag I made using it is kind of floppy and doesn’t stand up on its own very well. 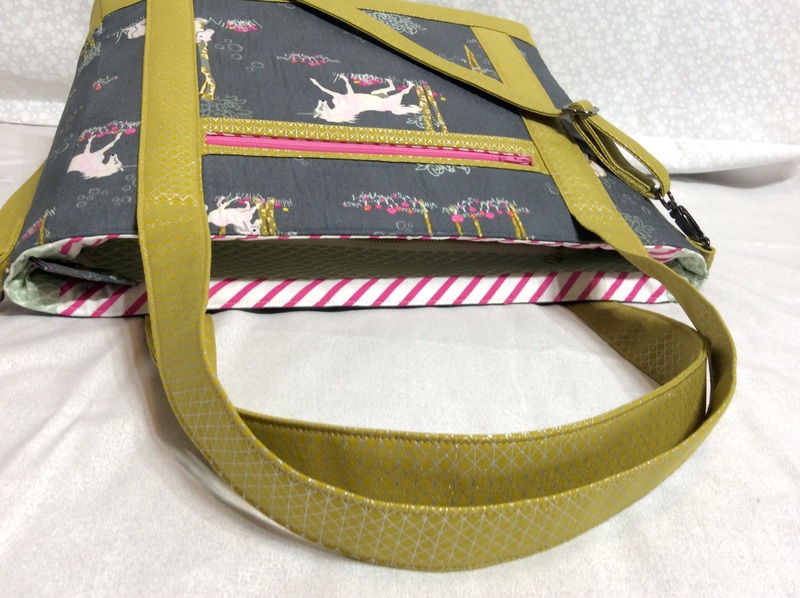 If you’re making a tote bag, or a craft project that you don’t want to feel stiff, this would be your best bet. However, for a larger bag – I would go with either the Bosal In-R-Form or Pellon Flex-Foam. Moore thoughts: Just got my bolt delivered a couple days ago, so I haven’t had too much time to play with it yet. Flex-Foam appears to have a slightly higher loft than Soft and Stable, but the Flex-Foam has about the same amount of stability as the Bosal In-R-Form (more than Soft and Stable). The fabric laminated to the foam is quite silky. Out of the three, the Flex-Foam is the least expensive and I feel it’s a combination of the best aspects of Bosal In-R-Form (stability) and ByAnnie’s Soft and Stable (loft). I also prefer to buy stabilizer/interfacing in large quantities and appreciate that Pellon offers this in entire bolts. 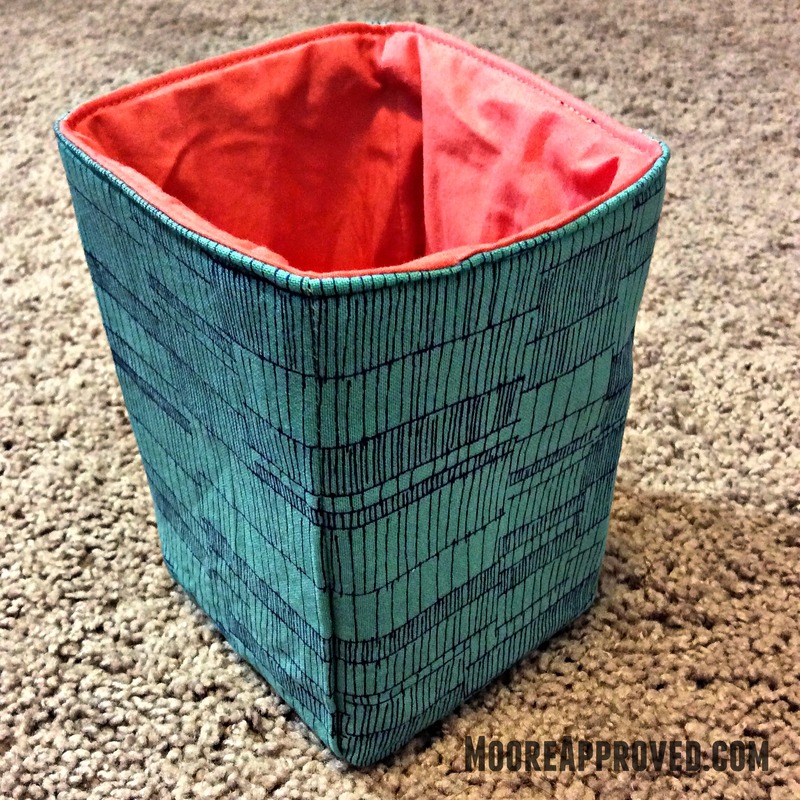 Project using Pellon Flex-Foam: Whipped up a quick fabric basket last night using scrap fabric – this took less than an hour. All three types of foam interfacing have benefits of their own, but I wanted to share my observations on how they are different. One thing they do have in common is how easy it is to sew through them. I do use a walking foot and a needle meant for denim fabric when I’m working with thicker material. 17 Responses to "Battle of the Foam Stabilizers"
Thank you for sharing your observations and opinions on these products. You’re graciously acting as the Consumer Reports of sewing. Many of us appreciate getting this feedback before we invest. I know I do. Thanks for your review of the various foam stabilizer products. We found them to be very interesting. First, you mentioned that you liked that FlexFoam is available in a larger bolt as you like to purchase larger quantities. Are you aware that Soft and Stable is available on a 15-yard bolt? We also offer FREE shipping on the bolt (with a discount code), so inch-by-inch that will work out to a retail cost of about $0.0079/inch, only $0.001 more than the FlexFoam at JoAnn’s coupon prices. At regular prices, the FlexFoam works out to $0.013/inch or almost twice as much. Second, please be aware that the FlexFoam is only 20″ wide, whereas ByAnnie’s Soft and Stable is 58/60″ wide so you will have much less waste with the Soft and Stable. Finally, please note that ByAnnie’s Soft and Stable is proudly made in the USA; FlexFoam is made in China. Thanks for reaching out Annie – great information for everyone reading and appreciate all you do for the sewing and quilting world! Her 15-yard roll will cost you $250.00, which does cut the cost per yard to $16.66, but you better get busy and start making a lot of bags to sell on Etsy! I LOVE LOVE LOVE By Annie’s Soft and Stable!! Where do you get the discount code? As a novice bag-maker, your review of these ‘foam stabilizers’ is a big help to me. What I find particularly helpful is that using just one product in every case isn’t really a good idea – seems one or the other out of these three may be best for a given project. Thank you for this review. Thank you for sharing this info with everybody. I have been researching and pretty much narrowed it down to these three products without actually making a bag. Since I do want a bag with firm sides, I really appreciate knowing that Annie’s product may not be the one I need. She claims in her class that her product is the only one that will produce satisfactory results, which also causes problems for anybody outside the U.S. Her bag is quite expensive to make so a lot of us are trying to cut costs without cutting quality. Of course, ‘expensive’ is relative depending on your financial status. Thanks again for sharing! Thanks so much. Good info. I’m at Joann trying to figure out what to buy. I also have used all three. I tend to agree with your assessment of the products. 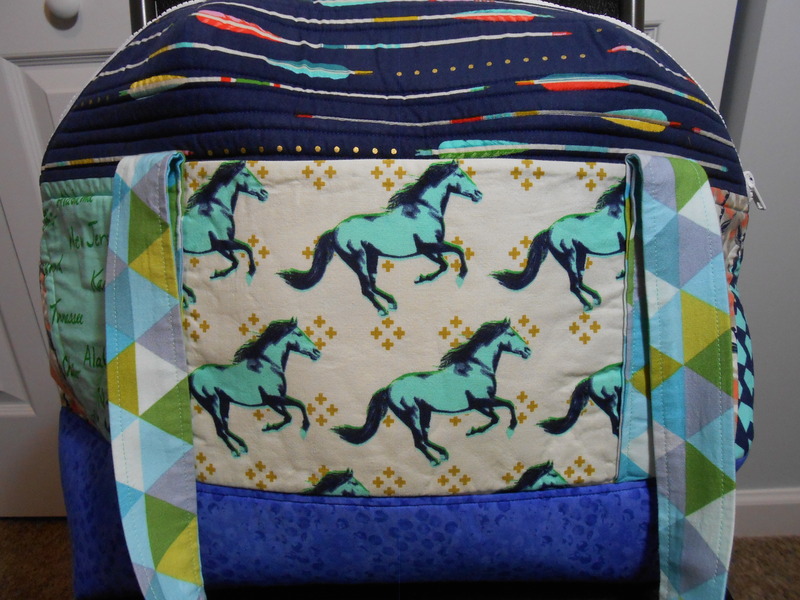 I make a lot of By Annie patterns that require a large piece of foam and two fabrics to be quilted. I love the end product of this, but I find that Soft and Stable slips, so I tend to use the Pellon that is fusible on both sides. The Bosal also works very well in this usage. If all I’m doing is sewing the Soft and Stable along the sides of my piece, Soft and Stable is a winner. I have also used all three in a project and not really noticed a difference. At what all of these cost, you don’t want to waste any of it. I have had the experience of dimpling/creasing with the Bosal, which affects the appearance of the bag. Do you get the same dimpling with the Pelion or S&S? Hi Shari, yes all three products can experience dimpling – but if I quilt the fabric and foam stabilizer I find that does help. The dimpling is primarily caused by the fusible coating that is applied to the Bosal product. Because the glue starts to separate with use, some parts are held and other parts give way — giving a cellulite look. You won’t have that problem with a sew-in stabilizer such as Soft and Stable. That is the biggest reason why I designed it to be sew-in, rather than fusible. This is a great discussion and I’ve learned a lot! Thank you!!!! Wonderful discussion! I have fused Pellon Decor Bond to a current, on my cutting table at the moment, bag pieces. It’s driving me crazy because I can’t get it to adhere evenly. I decided to take it off and go with either Bosal, which I have enough, or Soft and Stable, requiring trip to JoAnn’s. Annie, I now understand why S&S is a sew-in….didn’t realize it’s home grown. I think I hit JoAnn’s and go with S&S.